Excuse me, do you know the way to the athletics competition? Garmin is offering its sat nav customers the opportunity to find their way around Beijing with ease – no mean feat, as anybody that has visited China's seething capital will know. Garmin "the global leader" in portable satellite navigation (according to its own press materials) has just released City Navigator China NT 2008 "released just in time for tourists who plan on travelling to Beijing in August." Why anybody would have plans to visit Beijing in August is not made clear. We suppose they might want to see the Great Wall of China. 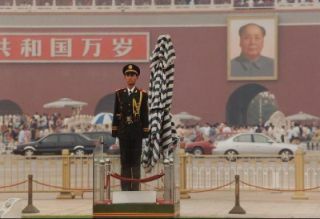 Or Tiananmen Square. Clive Taylor, Director of Product for Garmin said: "This new suite of digital maps helps tourists locate stadiums, hotels, restaurants, and more – so they can spend their time being spectators instead of worrying about how to get there." Spectators of what though? The Imperial Guard's fearsomely impressive formation marching perhaps? "Providing nearly seven million points of interest (POIs) and available on a convenient microSD/SD card, users simply insert the maps into selected nüvi personal navigation devices (PND)," adds Garmin. Road and POI names in City Navigator China NT 2008 are presented in Pinyin, the most common Latin-alphabet phonetic spelling of Mandarin Chinese. Impressively, the maps contain data on over 980 cities and the roads that connect them.